Size matters. Some MP3 players don't show album art if it's too large. Some music lovers don't want album art that is too small. If you have a large music collection, resizing album art can be a pain. 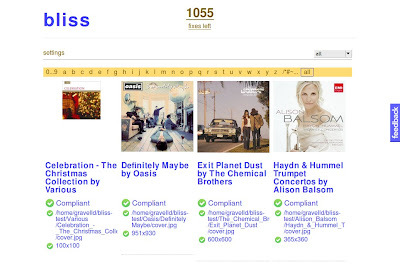 You may have hundreds or thousands of albums for which the album art must be resized. Resizing all of those images is bad enough, but if the art is embedded in your music files you also need to extract the art from each track, resize it and then re-embed it. This is a tedious, time consuming task. Resizing album art with bliss is simple. bliss is rule based, so with the album art rule you specify the constraints your album art should obey. bliss works in bulk, so you don't need to work file by file. Let's try an example where we shrink art to be no bigger than 300x300 pixels. Here I've exposed the '(why?)' link for each of the top albums, to show the current size of my album art. Now I set a rule that art should be no larger than 300x300 pixels. (bliss adds 10%, by the way, to make sure slightly larger art is not ignored when searching for alternative art). 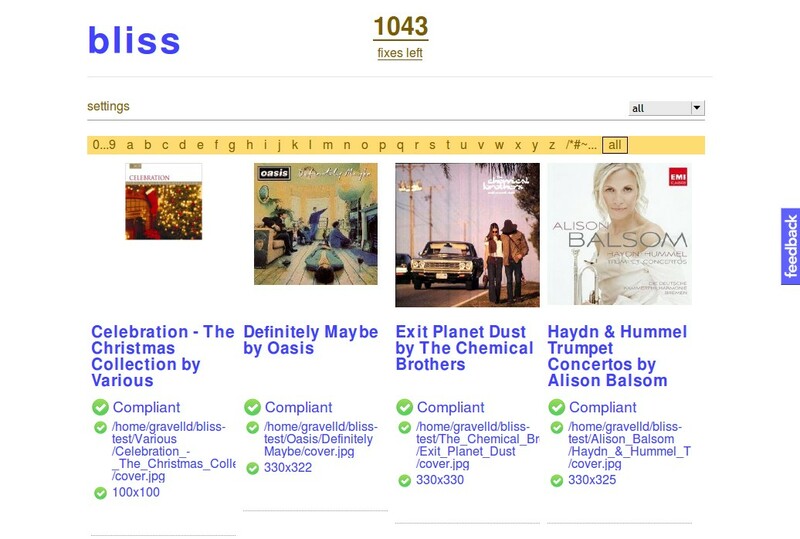 Bulk resizing of album art with bliss is easy. Just set the size constraints and you're done. Changed your mind? Change the setting again, one click is all it takes. This is the power of rule based music management.